Finally Google Latitude added a Check-in service to his app. A couple of weeks ago I was digging into Google Latitude and foursquare. I choose foursquare because he had a check-in service and everybody was using it. Now Google launches the same service (without badges and stuff) and it's pretty cool. It's functional, free and it will grow up if people start using it. 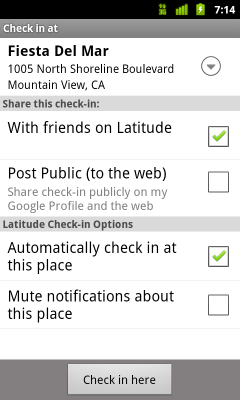 You can not add a venue to Google Latitude like foursquare. You can check-in everywhere. Just put your finger on the map and check-in there. 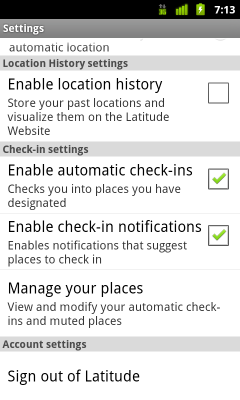 Google Latitude has automated check-in and check-outs. foursquare does not have check-out. Gaming. 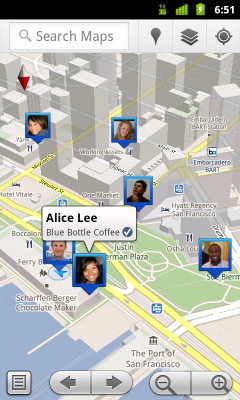 Google Latitude is not for gaming like foursquare is with all the badges, points and awards. 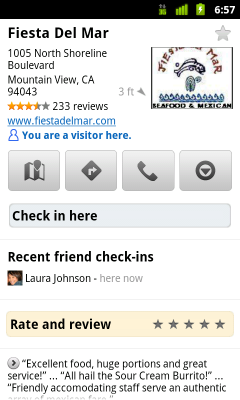 Google Latitude also has a reminder check-in. Every X minutes it reminds you to check-in. 4.789.757 post views so far. This page needed 40 queries to load.